The Entrepreneurial Lab at Parsons provides alumni of the SDS graduate programs and the DT graduate program the opportunity to realize their business projects in the different social design and tech sectors with benefits that include spaces, growth-supporting mentors, and a wide network of professionals. 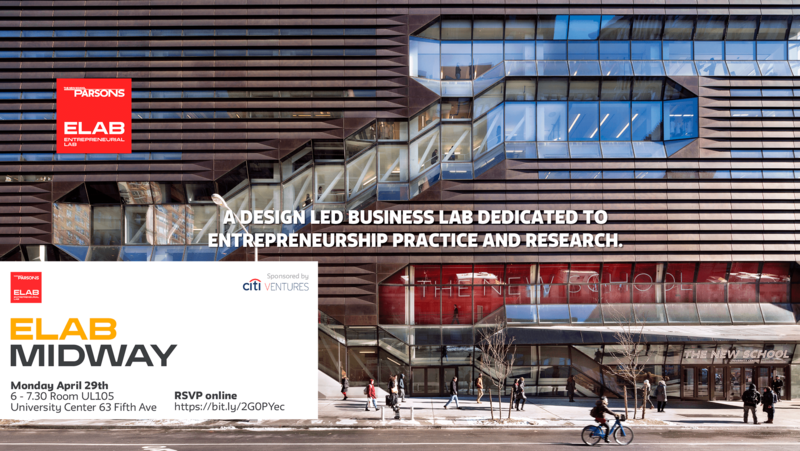 With partners focused on civic tech, social innovation, design, fabrication, and technology, the ELab supports Parsons startups around these industries. Apply here by October 9th! We know this is a live document and that it will change, a lot, but we’d like to see how thought out this business idea is and your grasp of the basic business structure you envision. Summarize the project’s background, development history, and your vision for its future, with particular focus on the project’s social purpose and potential impact, its economic feasibility, and its potential growth in the next 12 months. Specify how your participation and involvement in the communities and networks of our partner spaces will help progress your project’s aims and support your personal and/or professional development. In addition, please note any additional sources of financial support or sponsorship that your project is receiving. When did your project start and how long has it been running for? Describe short and long term impact. What stage is your project at and what were the main challenges? – A lease for seats at a partner’s coworking space within a specific sector that meets that specific startup’s needs including access to their network and programming within that community. – Access to Elab friends with expertise in various sectors who are available to be mentor or coaches for up to 3hr scheduled quarterly check-ins. – ELab sponsored programming such as workshops + pitch nights. – The Elab intends to produce engaged successful entrepreneurs and one of the characteristics of a true entrepreneur is their shared value in the community, by giving back and networking. In our program, one of our strengths is in forging a tight community of fellows who support the mission of the Elab, because they have benefited most from its formation. – Fellows give talks, assist in mentorship and development, and support the Elab. They are expected to stay connected to the Lab for a minimum of 3yrs. – Fellows give 5 hours a week working on assisting the ELab in its daily operations, with tasks that range from social media to graphic design. The ELab fellows will attend each mentor appointment agreed upon benchmarks, attend a minimum of 2 workshops, host 1 workshop, present a midway business and financial update, a final exit interview, and a business and financial presentation.